Calgary wedding blog: Table decor tips… what’s most important! A place where most of your guest notice how much effort you’ve gone to, is the guest tables. This is where they will experience through their senses, the things that they’ll remember. From the smell of the flowers, the touch of the pressed linens, the feel of the warm glow from the candles, to the site of the breathtaking centrepieces. 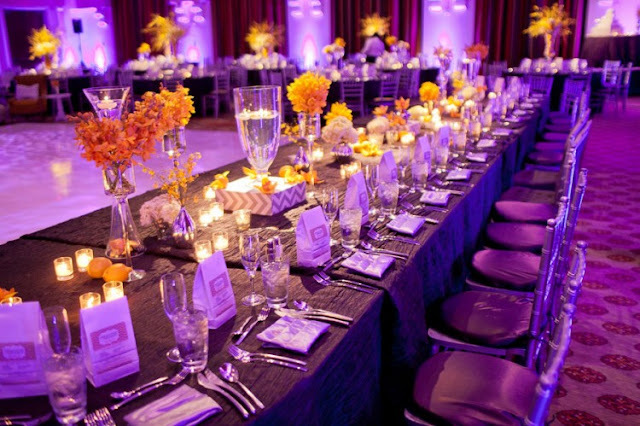 Here are a few tips to help make the most out of your table decor. 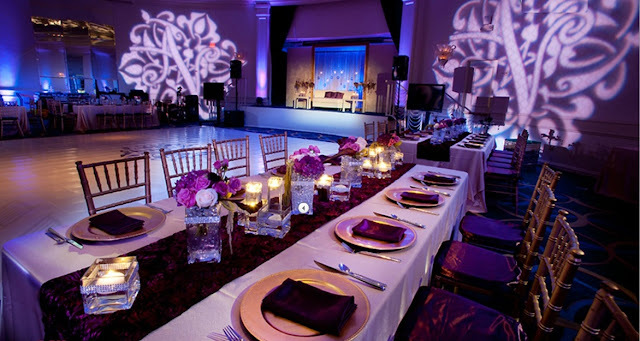 Since the guest tables are duplicated many times through out the ballroom, many of them together make a big statement. 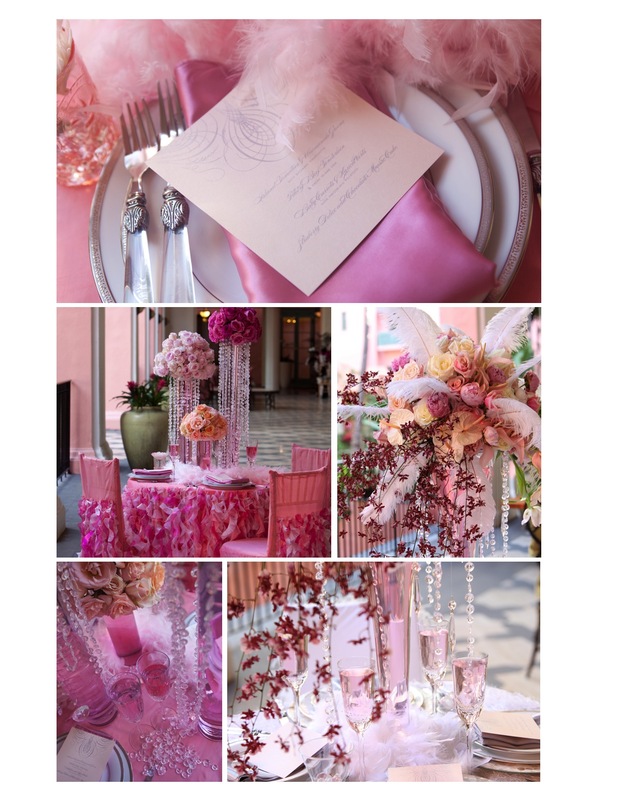 The centrepiece is considered the gem of the table, and should be the most important aspect on the table. Table size is often dictated by your guest numbers. Make sure you have the appropriate size table for the guest seated at it. If you have the luxury, often more smaller tables with less guests at each table can add a element of intimacy that you don’t get with a large table. What you don’t want, is so much space between place settings that your guests will feel removed from one another. Consider the linens on the table as the canvas in which you’ll place the centrepiece. Always make sure the linens “go to the floor”, seeing the table legs is a “no no!” Think about colour and how much of it you want to see in the room. Whether you choose neutral or colourful linens these will make a big impact in the room. Since there are typically many chairs in the room these will make a statement as well. 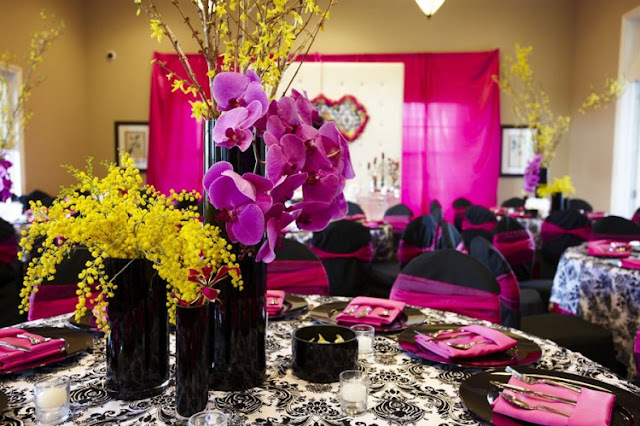 Chair covers often will neutralize the space and give you a clean palate to show off your tables. Chairs come in many different sizes, a good tip is to check the chair cover beforehand to make sure it actually fits the venues chairs. If you love colour add a coloured chair tie to complement the rest of the table. Our crystal chivari chairs somewhat disappear in a room, making the room feel more airy. They are great in those spaces where you may have to pack in the guests. One of the most important aspects of a centrepiece is the scale. Be mindful of the size of the centrepiece to the size of the table. A fully decorated table with a tiny centrepiece just doesn’t cut it! If you don’t want full floral on the table, then load it up with lots of candles. 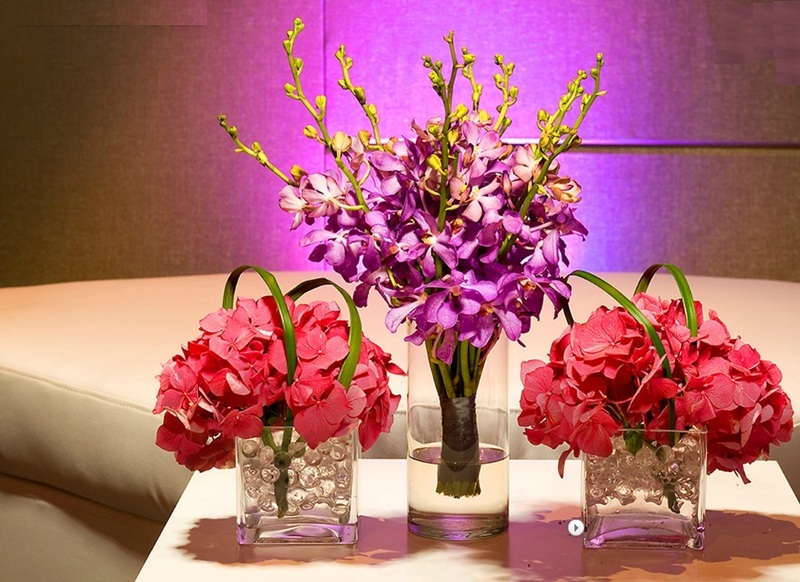 Doing a combination of high and low centrepieces alternating in the room can be a challenge. Getting it right is the key! Doing it solely, to save costs may not be right right choice. It works well when you have many tables, and you are able to create a visual pattern in the room, which breaks up “a sea” of the same look. A room with just a few tables where you can’t see a pattern, looks like you skipped out. When doing it make sure each style is as abundant as the other. Often high centrepieces are more dramatic than the low ones. Low centrepieces will need to be embellished, more floral and/or more candles, so that your guests don’t feel you placed them at a “B” table. Candles are an important feature on your table to add romance and glow. The type and how you use them is maybe even more important. The only place wax taper candles work well, is at home. Even when they say dripless, they still drip! The venues air conditioning system, room drafts, and wind are a candles nightmare! Make sure that each type of candle you use has it’s own container that the wax can drip into. Dripping wax on a rented candelabra, linens or other surfaces from candles can cause a huge unexpected “bill” at the end of your event. Consider floating candles in cylinders, gel votive candles, or protect a pillar candle in a hurricane vase for outdoor events where a breeze may be a factor. One of the most important key to a great table setting for your guest is comfort. Consider what you would feel if you were a guest seated at the table you are designing. Ask yourself: Can I see the other guests across the table? Are the chairs comfortable enough? Do I have enough room to get up and down from the table? Will I be too distracted with what’s on the table to experience the evening? Labels: calgary theme decor, calgary wedding decoration, Event design Calgary, Fusion bolywood Calgary, wedding Blog Calgary, wedding flowers calgary, Wedding tips.